Since I’m a major fan of pulp action adventure there’s very little chance of you getting a bad review of THE MUMMY: TOMB OF THE DRAGON EMPEROR outta me. I think it’s only fair to tell you that up front. Even though I did miss the direction of Stephen Sommers and Maria Bello is no substitute for Rachel Weisz. And yes, the climatic battle between the two undead armies did go on about five minutes longer than it should have and it’s true that Brendan Fraser didn’t have to yell: “I hate mummies!” every ten minutes. But I was willing to overlook all that and just allow myself to enjoy what is essentially a B-movie with an A-budget. It’s not the best of ‘The Mummy’ movies but it does exactly what it’s designed to do and really, that’s all I ask from any movie. Alex soon learns that he’s in way over his head as there are two factions fighting over the mummy of Emperor Han. 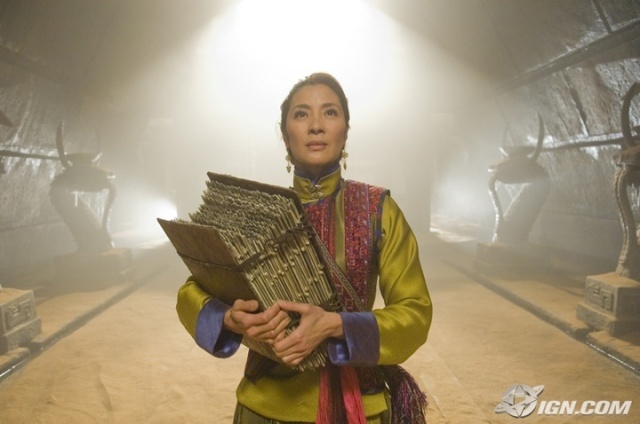 It turns out that Han was cursed by the witch Zi Juan (Michelle Yeoh) more than two thousand years ago to remain encased in living rock but he can be revived if one knows how. One faction knows how and it involves a giant diamond, The Eye Of Shangri-La while the other faction mostly consists of Zi Juan’s daughter Lin (Isabella Leong) and Zi herself (didn’t I mention both mother and daughter are immortal? I didn’t? Sorry, my bad) Rick and Evelyn are soon heading to Shanghai to help out their son, picking up Evelyn’s brother Jonathan (John Hannah) and a half-drunk pilot, Mad Dog Maguire as backup. It’s a race against time to find the mystical city ofShangri-La and stop Han from reclaiming his humanity and his awesome mystic powers to control the five elements (earth, air, fire, water and metal) which he needs to resurrect his army of warriors and resume his ambition of ruling the world. Considering that he’s now in the year 1946 and his men are armed with spears and swords while modern armies have bombs, machine guns and tanks, I must say that admire Han’s confidence. Me, I don’t think that the modern world would have sweated Han too much, even with his magic powers but then we wouldn’t have much of a movie, would we? 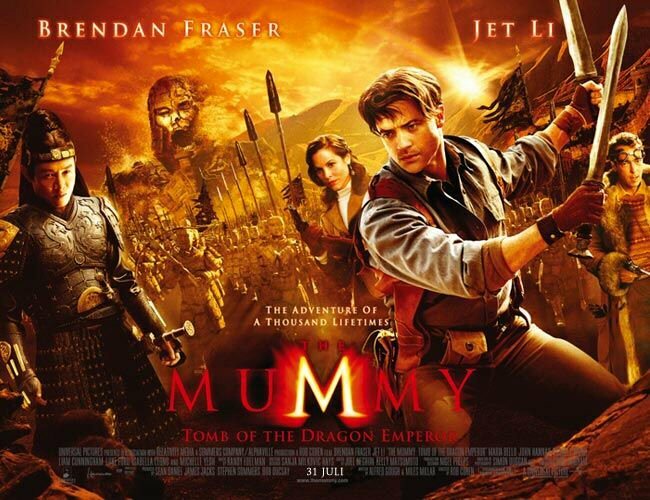 How much you want to see this movie depends on how much you like pulp adventure, Brendan Fraser, Jet Li, Michelle Yeoh or the previous ‘Mummy’ movies I would guess. The ‘Mummy’ movies have been looked upon as ‘Indiana Jones Lite’ but I think that’s unfair. There’s more enough room for two globe-hopping adventurers in the movies today and indeed, back in the 30’s and 40’s where these movies are set you could go to your local theater or newsstand and there were literally dozens of movies and magazines featuring two-fisted men of action that were the grandfathers of both Rick O’Connell and Indiana Jones. What sets the ‘Mummy’ movies apart and especially TOMB OF THE DRAGON EMPEROR is the interaction between this family of adventurers. Alex has grown up into his own man and his style of adventuring is different from his mom and his dad’s. But even though father and son have their differences they can still bond over mutual interests such as what’s the best machine gun to use against a rebel Chinese army trying to kill you or exactly how much dynamite it takes to blow up a golden shrine. Evelyn is trying hard to be a lady and a respectable mom but she’d much rather be raiding tombs and destroying evil mummies trying to take over the world. Jonathan has become a successful nightclub owner but he drops it all to help out his brother-in-law, sister and nephew save the world. Of course the fact that Rick and Evelyn have The Eye Of Shangri-La has nothing to do with it. Michelle Yeoh walks away with the acting honors in this one. Her character has a fascinating back story and the first ten or fifteen minutes of the movie relates that in such a way that you almost wish the entire movie would continue that story. She’s never anything less than convincing and of course any time you get to see two such masters such as her and Jet Li fight on screen that’s a definite bonus. Don’t look for a lot martial arts from Jet Li in this one. He does have some nice fight scenes but nothing spectacular. 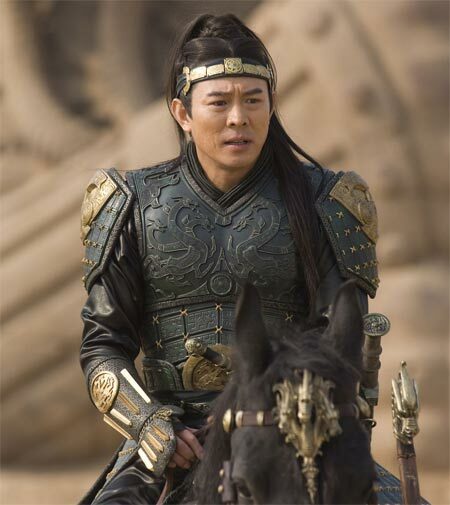 And I’m always delighted to see Russell Wong in anything as I was a major fan of ‘Vanishing Son’ and he has a small but pivotal role in this movie. So should you see THE MUMMY: TOMB OF THE DRAGON EMPEROR? I would say yes. It’s a totally undemanding movie and asks nothing more than you sit back, relax and have fun. It’s got hidden tombs with lethal death traps, undead armies, Abominable Snowmen, Shangri-La, plenty of chases, fights and last minutes escapes from fates worse than death. And it’s done with style, good humor, top notch stunts and special effects. It’s one of the most enjoyable Saturday Afternoon Movies I’ve seen in quite a while. I know that movie came out so long ago but wow u lik that movie too I lik adventures and those movies on the mummy r my favorite I hope they comeout with more. What about u? You’ve hit the nail square, Derrick. The family interaction is what makes this series great. The kid in MUMMY RETURNS is one of the best parts of the movie – I love that he’s a smart, capable kid that’s totally at home on an adventure (even when separated by his parents) but the sight of mom and dad kissing turns his stomach.